Observations from Governor’s School for the Humanities | Map This! Over the past few weeks I have had the fortune of helping Dr. Robert Nanney, chair of the Department of Communications, with the Governor’s School for the Humanities newspaper. UT Martin hosts both the Governor’s School for the Humanities (GSH) and GS for the Agricultural Sciences. There are also GS’s for the Arts and for the Sciences somewhere else in the state. Bu enough of the background, right? Every day, the newspaper staff meets in a classroom next to The Pacer office to discuss stories and the progress being made toward putting together the final product: a 16-page newspaper that will cover all the important events at Governor’s School. My job is to do whatever needs to be done (note to self: reword that description for the resume…) I’ve set up an e-mail account and distribution list for the staff. I’ve kept a list of all the stories assigned and e-mailed them out in a story budget to the staff. I’ve organized the network space for their stories, photos and pages to be stored where they can be accessed from The Pacer office. I’ve worked with the executive editor on how to organize the paper, and early next week we will start working on page layout. 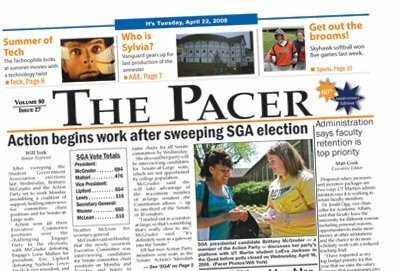 For those of you who know how much effort I put into production of The Pacer every week during the school year, the work I’m doing for the GSH newspaper may seem tedious or insignificant. I seriously do have to tell myself to let them have their fun and not do too much for them, but the real fun for me is helping with the instruction. Nothing confirms my choice to become a professor more than working with younger students on something hands-on. Another observation I have made is that I’m glad I have chosen to teach at the collegiate level. Much as I love the enthusiasm of these high schoolers, I’m frequently reminded of how far they will need to come before they are fully able to handle college life in a mature fashion. Don’t get me wrong, I see it in some of them, but the majority of them currently demonstrate their lacking by frequently vocalizing hatred at middle school and high school cheerleaders on campus for UT Martin’s Cheer Camp and the Ag Governor’s School students. I feel like making a speech telling them to get over themselves and learn to get along, but that is one life lesson that is often quite difficult for even the smartest high school student. Anyway, I make no promises on if I will update the blog again during the GSH experience, but if sometime sparks my interest or thought, you’ll probably read about it here.